Guava is the common name for any of the various tropical shrubs and small trees comprising the New World genus Psidium of the myrtle family (Myrtaceae), characterized by tough, dark, opposite leaves and an edible fruit. The term guava also is used for the fruit, which is a true berry. The name guava particularly is associated with the commercially important common or apple guava, Psidium guajava, which is grown for its sweet, juicy fruit. 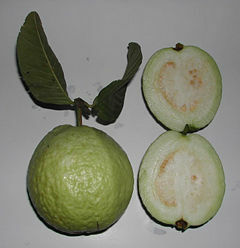 The cattley guava, Psidium littorale (syn. P. cattleianum) is another well-known species, with two notable varieties: the red-fruited strawberry guava, and the yellow-fruited lemon guava. There are about 100 species of guava, with the plants native to Mexico, the Caribbean, Central America and northern South America, but now cultivated in the parts of the United States and other tropical areas. The name is drawn from the Arawak via Spanish guayaba. The guava fruit, which is so important for the reproduction of the plants, also serves as a nutritious and flavorful food for people as well as for various birds and mammals (who also act as dispersal agents for the seeds). In folk medicine, guava leaves have been used for treating ailments ranging from cancer to inflammation and diabetes. The plant itself is used for ornamental purposes. Guava is in the Myrtaceae or myrtle family, a taxon of dicotyledon plants that includes such well-known representatives as myrtle, cloves, feijoa, allspice, and eucalyptus. All species of the family are woody, with essential oils, and have flower parts in multiples of four or five. The flowers have a base number of five petals, though in several genera the petals are minute or absent. The stamens are usually very conspicuous, brightly colored and numerous. The leaves are evergreen, alternate to mostly opposite, simple, and usually with an entire (not toothed) margin. One notable character of the family is that the phloem is located on both sides of the xylem, not just outside as in most other plants. Within the myrtle family, guavas are placed in the subfamily Myrtoideae. This subfamily is characterized by fleshy fruits and opposite, entire leaves. Most genera in this subfamily have one of three easily recognized types of embryos. The genera of Myrtoideae can be very difficult to distinguish in the absence of mature fruits. Members of the genus Psidium, the guavas, are typical Myrtoideae, with tough dark leaves that are opposite, simple, elliptic to ovate, and 5-15 centimeters long. The flowers are white, with five petals and numerous stamens. Members of the genera Accara and Feijoa (= Acca, pineapple guava) were formerly included in this genus as well. The guava fruit is a true berry. In botany, a berry is a fleshy or pulpy indehiscent fruit in which the entire ovary wall ripens into a relatively soft pericarp, the seeds are embedded in the common flesh of the ovary, and typically there is more than one seed. Other examples of botanical berries include the tomato, grape, avocado, and persimmon. The guava fruit is edible, round to pear-shaped, from 3 to 10 centimeters (cm) in diameter (up to 12 cm in some selected cultivars). It has a thin delicate rind, pale green to yellow at maturity in some species, pink to red in others, a creamy white or orange-salmon flesh with many small hard seeds, and a strong, characteristic aroma. The aroma generally is reminiscent of refreshing fruit like apples, passionfruit or strawberries, with an inoffensive acidity and a fragrance reminiscent of rose petals. Guavas are cultivated in many tropical and subtropical countries for their edible fruit. Several species are grown commercially. Apple guava (P. guajava) and its cultivars are those most commonly traded internationally. Cattley guava or Peruvian guava (Psidium littorale; the old name P. cattleianum is still used very often) is a small tree (2-6 meters tall), bearing small red or yellow fruit, which are somewhat sour but sometimes eaten or made into jam. The red-fruited strawberry guava is Psidium littorale var. cattleianum. The yellow-fruited Psidium littorale var. littorale is known as lemon Guava, and in Hawaiʻi as waiawī. It is native to Brazil and adjacent regions of tropical South America. Mature trees of most guava species are fairly cold-hardy and can survive as low as 5°C for short periods of time, but younger plants will not survive. They are known to survive in Northern Pakistan where they can get down to 5°C or lower during the night. Guavas are also of interest to home growers in temperate areas, being one of the very few tropical fruits that can be grown to fruiting size in pots indoors. The fruit is relished by many mammals and birds. The spread of introduced guavas owes much to this fact, as animals will eat the fruit and disperse the seeds in their droppings. Psidium species are used as food plants by the caterpillars of some Lepidoptera, mainly moths like the Ello Sphinx (Erinnyis ello), Eupseudosoma aberrans, Snowy Eupseudosoma (E. involutum) and Hypercompe icasia. Mites like Pronematus pruni and Tydeus munsteri are known to parasitize Apple Guava (P. guabaya) and perhaps other species. The bacterium Erwinia psidii causes rot diseases of the Apple Guava. In several tropical regions, including Hawaiʻi, some species (namely cattley guava, P. littorale) have become invasive weed shrubs. On the other hand, several species have become very rare and at least one species, Jamaican guava (P. dumetorum), is considered to have recently gone extinct. Guava is used for culinary and ornamental purposes. With a history in folk medicine, it also is the subject of research for medicinal purposes. 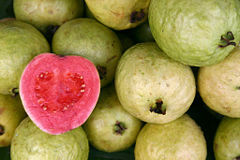 Guavas may be eaten raw or used in jams, jellies, juices, preserves, and sauces (Herbst 2001). The whole fruit is edible, from seeds to rind, but many people choose to cut out the middle that contains hard seeds embedded in the surrounding pulp. The pulp is sweetest and most delicious in the center, with the outer layer being sour and gritty like young pears, while the peel (fruit) is sour in taste but richest in phytochemicals. The peel usually is discarded but can be eaten as an enriched source of essential nutrients and polyphenols (Jiménez-Escrig et al. 2001). The fruit is also often prepared as a dessert. In Asia, fresh raw guava is often dipped in preserved prune powder or salt, and a tea is made from guava fruits and leaves. In Egypt and South Africa, guava juice is popular. Red guavas can be used as the base of salted products such as sauces, constituting a substitute for tomatoes, especially for those sensitive to the latter's acidity. Guava wood is used for meat smoking in Hawaii and may be used to barbecue. Guavas are often considered superfruits, being rich in vitamins A and C, omega-3 and omega-6 polyunsaturated fatty acids, and especially high levels of dietary fiber. Containing about half the amount (37 mg per 100 g) of vitamin C as a raw orange, a single strawberry guava also has good levels of the dietary minerals, potassium, and magnesium, and otherwise a broad, low-calorie profile of essential nutrients (ND 2008a). Common guava has generally a more diverse and dense nutrient content, including extraordinary richness of vitamin C (228 mg per 100 g) (ND 2008b). Guavas contain both major classes of antioxidant pigments—carotenoids and polyphenols—giving them relatively high dietary antioxidant value among plant foods (Mahattanatawee et al. 2006; Hassimotto et al. 2005; Jiménez-Escrig et al. 2001). 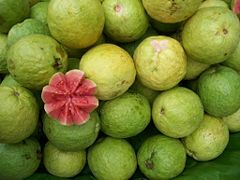 Since the 1950s, guava, particularly its leaves, has been the subject of diverse research initiatives to map the chemical identity of its constituents, pharmacological properties, and history in folk medicine (Gutiérrez et al. 2008). From preliminary medical research in laboratory settings, extracts from guava leaves or bark are implicated in possible therapeutic mechanisms against cancer, bacterial infections, inflammation, and pain (Chen et al. 2007: Mahfuzul et al. 2007; Ojewole 2006). Essential oils from guava leaves have shown strong anti-cancer activity in vitro (Manosroi et al. 2006). Guava leaves are used as a remedy for diarrhea (Kaljee et al. 2004), and for their supposed antimicrobial properties. The same anti-diarrheal substances useful in folk medicine may also cause constipation when large amounts of guava fruits are consumed. Guava leaves or bark have been used traditionally to treat diabetes (Mukhtar et al. 2006; Oh et al. 2005). Chen, K. C., C. L. Hsieh, C. C. Peng, H. M. Hsieh-Li, H. S. Chiang, K. D. Huang, and R. Y. Peng. 2007. Brain derived metastatic prostate cancer DU-145 cells are effectively inhibited in vitro by guava (Psidium gujava L.) leaf extracts. Nutr Cancer 58(1):93-106. Retrieved April 22, 2008. Gutiérrez, R. M., S. Mitchell, and R. V. Solis. 2008. Psidium guajava: A review of its traditional uses, phytochemistry and pharmacology. J Ethnopharmacol. 117(1):1-27. Retrieved April 22, 2008. Hassimotto, N. M., M. I. Genovese, and F. M. Lajolo. 2005. Antioxidant activity of dietary fruits, vegetables, and commercial frozen fruit pulps. J Agric Food Chem. 53(8):2928-35. Retrieved April 22, 2008. Jiménez-Escrig, A., M. Rincón, R. Pulido, and F. Saura-Calixto. 2001. Guava fruit (Psidium guajava L.) as a new source of antioxidant dietary fiber. J Agric Food Chem. 49(11):5489-93. Retrieved April 22, 2008. Kaljee, L. M., V. D. Thiem, L. von Seidlein, B. L. Genberg, D. G. Canh, L. H. Tho, T. T. Minh, L. T. K. Thoa, J. D. Clemens, and D. D. Trach. 2004. Healthcare use for diarrhoea and dysentery in actual and hypothetical cases, Nha Trang, Viet Nam]. Journal of Health, Population and Nutrition 22(2): 139-149. Retrieved April 22, 2008. Mahattanatawee, K., J. A. Manthey, G. Luzio, S. T. Talcott, K. Goodner, and E. A. Baldwin. 2006. Total antioxidant activity and fiber content of select Florida-grown tropical fruits. J Agric Food Chem. 54(19):7355-63. Retrieved April 22, 2008. Mahfuzul, H., M. L. Bari, Y. Inatsu, V. K. Juneja, and S. Kawamoto. 2007. Antibacterial activity of guava (Psidium guajava L.) and Neem (Azadirachta indica A. Juss.) extracts against foodborne pathogens and spoilage bacteria. Foodborne Pathog Dis. 4(4):481-8. Retrieved April 22, 2008. Nutrition Data (ND). 2008a. Guavas, strawberry, raw. Nutritiondata.com. Retrieved April 22, 2008. Nutrition Data (ND). 2008b. Guavas, common, raw. Nutritiondata.com. Retrieved April 22, 2008. Oh, W. K., C. H. Lee, M. S. Lee, E. Y. Bae, C. B. Sohn, H. Oh, B. Y. Kim, and J. S. Ahn.2005. Antidiabetic effects of extracts from Psidium guajava. J Ethnopharmacol. 96(3):411-5. Retrieved April 22, 2008. Ojewole, J.A. 2006. 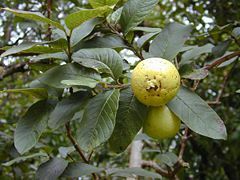 Antiinflammatory and analgesic effects of Psidium guajava Linn. (Myrtaceae) leaf aqueous extract in rats and mice. Methods Find Exp Clin Pharmacol. 28(7):441-6. Retrieved April 22, 2008. Fruits of Warm Climates: Guava. California Rare Fruit Growers: Tropical Guava Fruit Facts. This page was last modified on 18 July 2017, at 15:04.